Do you have red rimmed eyes and eyelids? Suffer from recurrent styes? Watering? Burning? Foreign body sensation? Puffy eyelids? Light sensitivity? If you answered yes to a few of these questions, chances are you have a type of inflammatory dry eye condition we refer to as ocular rosacea. Ocular rosacea is a very common finding; studies suggest the incidence of ocular rosacea could be as high as 72% of patients with rosacea, and many of us with rosacea are undiagnosed (Chronic facial redness and flushing? You've probably got it and just haven't been formally diagnosed!). For years we've been treating ocular rosacea-related dry eye with lid hygiene, artificial tears, and more recently pulsing doses of oral doxycycline used to target inflammation more-so than for any antibacterial properties. But a new study published in the International Journal of Ophthalmology last month suggests that Restasis, an anti-inflammatory eye drop used for treating dry eye, may be even more effective than our current gold standard treatment of oral doxycycline pulsed for months at a time. The study followed 38 patients with diagnosed rosacea and ocular rosacea signs and symptoms. The group was split evenly with 19 patients being started on Restasis eye drops taken twice daily for 3 months, and the other 19 patients being placed on 100 mg oral doxycycline taken twice daily for one month, then once daily for the two months. All patients were instructed to use daily eyelid hygiene and artificial tears 4 times a day throughout the study period. Before the study began and then monthly thereafter, patients were scored on symptoms (burning? watering?) and clinical signs (eyelid redness? corneal staining?) by a group of ophthalmologists. Standard protocol dry eye testing was also performed at these visits, including OSDI surveys, Schirmer's Test and tear break up time. The table above breaks down the results. 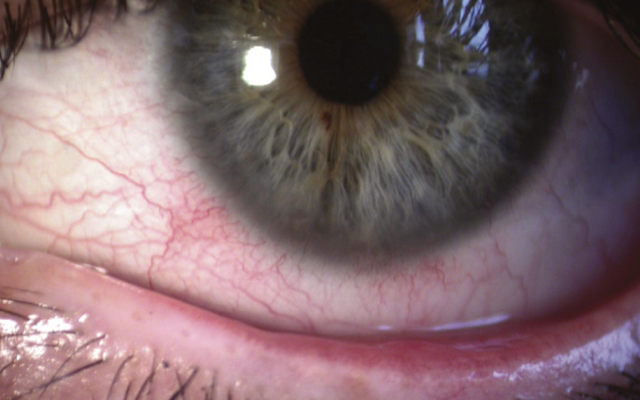 Of note, 100% of patients prior to the study had burning and stinging complaints, redness of their conjunctiva (white of the eye), and clogged meibomian glands (inspissation -- see image below!). Based on the difference in signs and symptom scores from baseline to 3 months of treatment, Restasis users had statistically significant more effective relief of both their ocular symptoms and their eyelid signs as compared to the doxycycline group. Corneal signs did not differ between the treatment groups by a statistically significant amount. There was also no statistically significant difference in the improvement in Schirmer and TBUT scores between the two groups -- both groups showed improvement in scores from baseline, though the Restasis group did have a higher mean improvement in those scores. anti-inflammatory medications, be they topical like Restasis or oral like doxycycline. In addition to better performances in several categories of dry eye assessment, Restasis also has the luxury of having a better safety profile. The most common side effect of Restasis is burning upon instillation, while oral doxycycline has the risk of causing increased risk for sunburns and stomach upset. Neither Restasis or doxycylcine can be used in pregnant or nursing mothers. Because rosacea as a condition is chronic, using a drop like Restasis year round may be better suited than intermittent doxycycline pulses to control symptoms long term. Another point of interest is that studies repeatably show Restasis performs even better at month 6 and month 12 than it does after just 3 months of use, so if the study had been extended out it would be interesting to see if Restasis users continued to have larger and larger improvements. Thanks for this! I have had severe allergic conjunctivitis and ocular rosacea symptoms for years. I started Restasis 3 weeks ago with little hope that it would work because nothing has. I am now symptom free. My eyes feel comfortable for the first time in so long. No more itching, redness, burning, or swollen lids. I can finally stand sunlight (my eyes were so severely affected that I often wore sunglasses inside to help with photosensitivity to all light). I never comment on things, but I'm just in awe of how this has worked for me and I wanted to back up your post here with some good old anecdotal evidence. Restasis works!